Learn Like A Mom! 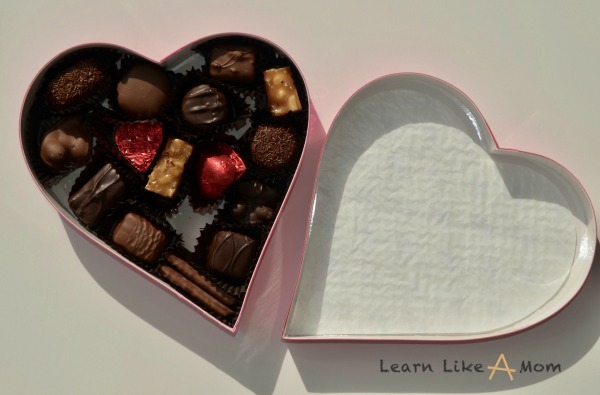 Valentine's Day Candy Box Games - Learn Like A Mom! From flowers to chocolate and jewelry to special dinners, Valentine’s Day really is a celebration! 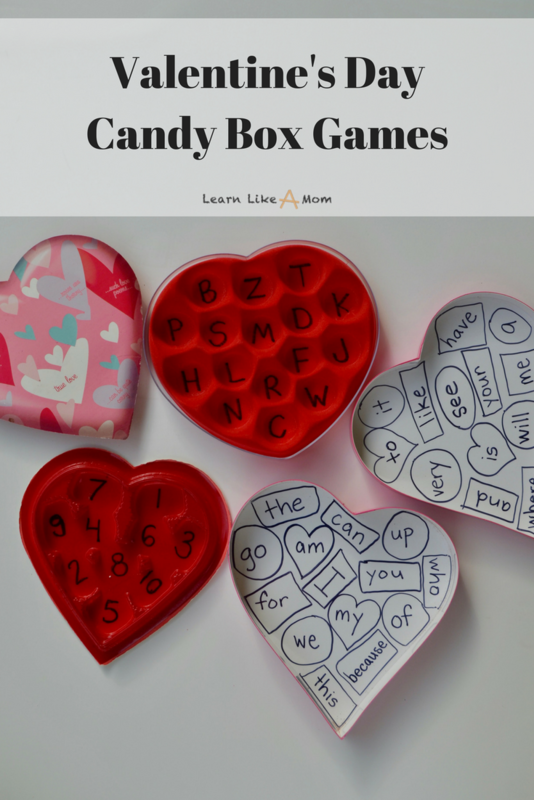 As the the dinner is long gone, the flowers begin to wilt, and the chocolate has been eaten, I encourage you to repurpose those candy boxes into Valentine’s Day candy box games for little learners. Valentine’s Day is one of the holidays that is still celebrated in schools across America and in my humble opinion, it’s a nice one to keep around. People don’t really write letters much these days, but children maintain a fascination with snail mail. The act of writing, sending, and receiving mail is just exciting! I talk about this with thank you notes and you can see it when the mail truck comes down the street. I guess if most adults are honest, we also feel joy when we sort through junk mail and find an actual card or letter from someone! It doesn’t take long and doesn’t cost much, but it sure makes a difference! Grab whatever candy box you are given or bought yourself! We just received this awesome See’s Candies one. Some will have dividers in the bottom that the chocolates or candies sit in. Others may not. It doesn’t matter. Wipe out the container so you don’t have little chocolate shavings in the box. In the top photo, you can see that I have previously made Valentine’s Day candy box games that use numbers or letters. These candy boxes had natural dividers. For the most recent game, I drew shapes within the candy box, attempting to resemble candies. With this box, I could make use of the top and the bottom as well, so why not? I decided to make this a sight word game to increase my son’s ability to recognize and read high frequency words from the English Language. So, within each shape, I wrote one of the top most used words in English. I did this with a different word in each shape until all of them contained a sight word. What you play certainly depends on what you have decided to put inside your Valentine’s Day candy box. I will walk you through the three examples I have shown in these images and provide some variations. This list is not exhaustive by any means, but will give you some ideas of what you can do. The Valentine’s Day box that has numbers written in it can be used to identify numbers, count, or help with matching quantities to numerals. Have a learner toss a paper clip or coin into the candy box and say the name of the number it lands on. Have a learner toss a paper clip or coin into the candy box and then count to that number. Have some objects nearby that can be used for counting. Have a learner toss a paper clip or coin into the candy box and then count out that number of objects using one-to-one correspondence. 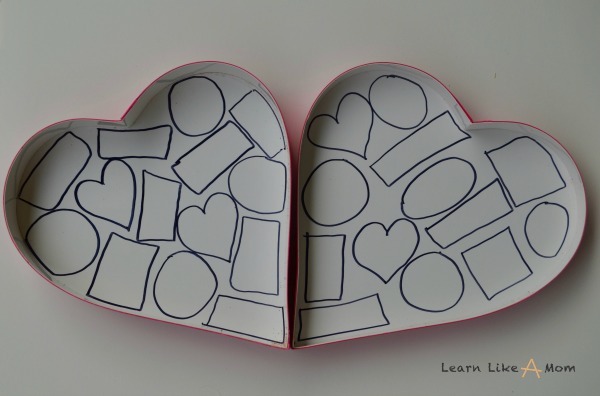 The Valentine’s Day box that has letters written in it can be used for letter recognition, letter sounds, or writing practice. Have a learner toss a paper clip or coin into the candy box and say the name of the letter it lands on. Have a learner toss a paper clip or coin into the candy box and say the sound that the letter makes or you could have them say a word that begins with that letter. Have a learner toss a paper clip or coin into the candy box, say the letter, and then write the letter. You could also have them write the lowercase letter if you have uppercase letters in the candy box. You could also have them try to stretch out a word that begins with the letter they land on and write it. You may even have them complete all three tasks. Sight words are high frequency words that children should know by sight. 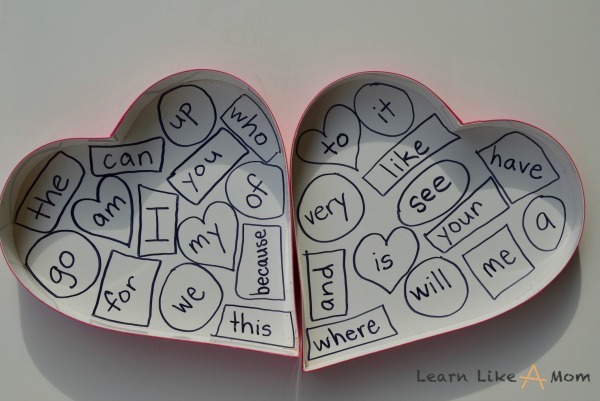 The Valentine’s Day box with the words can be used for sight word recognition or writing sight words. Have a learner toss a paper clip or coin into the candy box and say the word it lands on. Have a learner toss a paper clip or coin into the candy box and say the word it lands on, and then have them write the word. You can also have them spell it out loud. 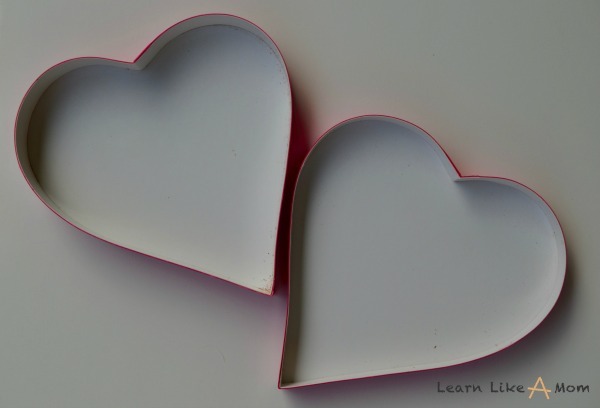 Whichever way you decide to use the Valentine’s Day candy box games, I am certain that children will enjoy them and learn something in the process. They are an easy way to repurpose your candy boxes into something a little fun and I have used them in classroom centers as well as at home with individual learners. They can be used for all sorts of learning activities across the curriculum! You may also like my list of Books About Kisses! Oh! And if your kids like mail, they may enjoy this Valentine’s Mail Book and Game. 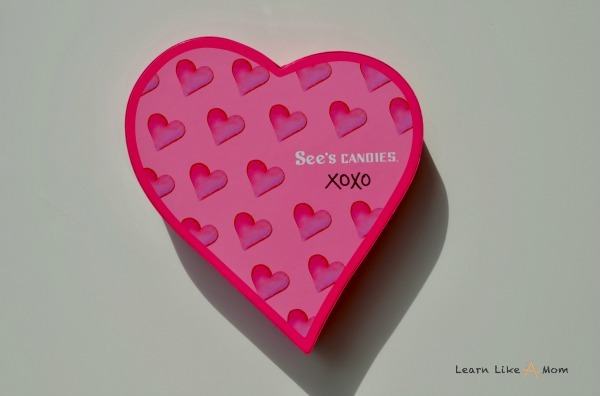 What would you make with your Valentine’s Day candy box?